by Billie Doux and Tara Dilullo (who now writes as Tara Bennett). Originally published in 2003 on a now defunct web magazine. Buffy the Vampire Slayer may be over, but loyal fans will never let it disappear. Books, magazines, merchandise, and spin-offs (more than one, hopefully) will keep the love alive. All this is well and good, but do you want more? Like maybe following the actual path of the Slayer? Fear not! Billie and Tara understand your need (compulsion, obsession, whatever) because we’ve been there. Literally. We have both traveled to many of the actual locations used for filming Buffy and Angel, and we are going to share with you some of the best -- just in case you ever make a Slayer pilgrimage to Los Angeles. And if a trip isn't in the offing, hey, enjoy our photos and the vicarious fun of talking about it. One day, her friend said, "Want to go see Sunnydale High?" and Billie, who had never considered such a thing, said with great excitement, "Are you kidding?" So they trucked on down to see Torrance High School (2200 Carson, in Torrance). It's hard to catch a glimpse of the interiors and the courtyard; there are fences and chains and such. But Billie did touch the railing Xander fell under in "Welcome to the Hellmouth," and the tree Giles walked into in "Earshot." Little things mean a lot to the obsessive Buffy fan. 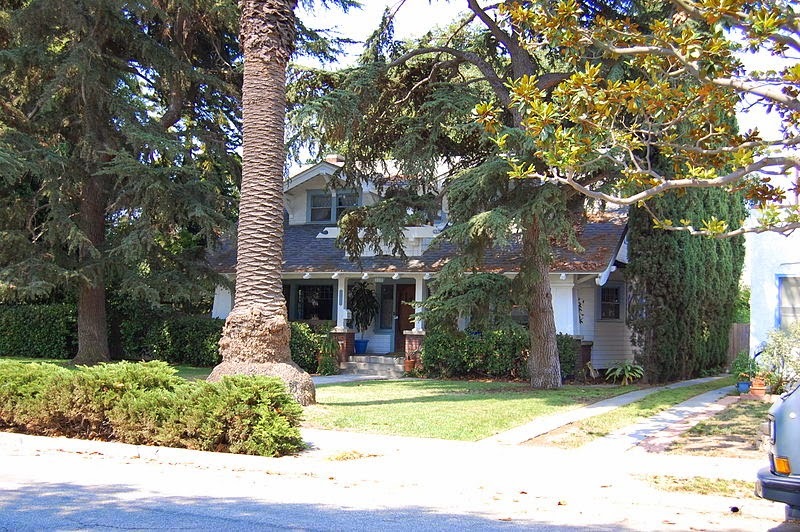 The original house Buffy, Joyce and Dawn lived in on Revello Drive is rarely used for filming now. Joss Whedon tells a wonderful anecdote about how they used so many explosives at the high school in the season three finale that every car alarm in Torrance went off in the middle of the night, and the town wasn't all that thrilled about having them back. So they reproduced the house at the studio in Santa Monica as a standing set. The real house is a private, functional home where average, non-demonic people live, so we won’t be disclosing the address for privacy issues. In fact, Billie was uncomfortable about standing outside and staring, so she didn't; she drove by quickly on a Sunday morning, took a couple of photos, and left. It's a lovely house, and all the more poignant to see now, since technically, in the Buffyverse, it lies smashed into a million pieces in the depths of a crater. When Billie moved to Los Angeles, she was often in Culver City, and kept passing a building that looked... strangely familiar. 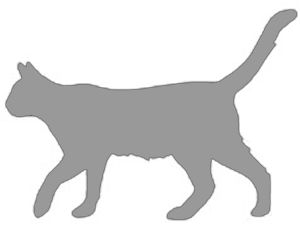 One day, it hit her: it was Wolfram and Hart. (Sony Pictures Plaza, 10202 W. Washington Boulevard, Culver City). 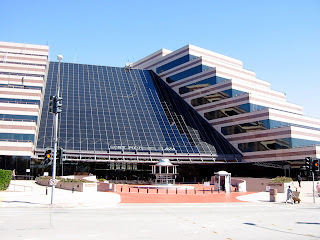 Wolfram and Hart, the seat of evil and now Angel's new base of operations, is actually a building that Billie sees almost on a daily basis. Definitely something that can weird you out. A long way down on the same street as Wolfram and Hart is another Buffyverse landmark. Rosedale is fascinating. Not in the best of neighborhoods, it is surrounded by a cement block fence topped with barbed wire. 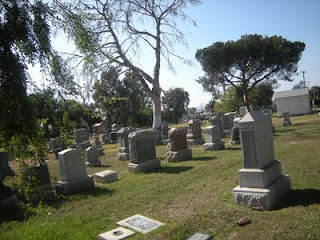 Many of the monuments are unusual and striking, making it a great stand-in for Sunnydale. The cemetery closes at 5 p.m., so you won't get to see it in the dark. This is probably a good thing, because of the uncontrolled vampire population. The Los Altos looks smaller than Angel Investigations, somehow. A peep in the windows shows a much different layout than what we’ve seen in the series. But if you look closely, you can see Angel's room on the second floor, far left; it's the one with the black-out curtains.... just kidding. The courtyard is open to visitors, but the building itself, understandably, is locked. 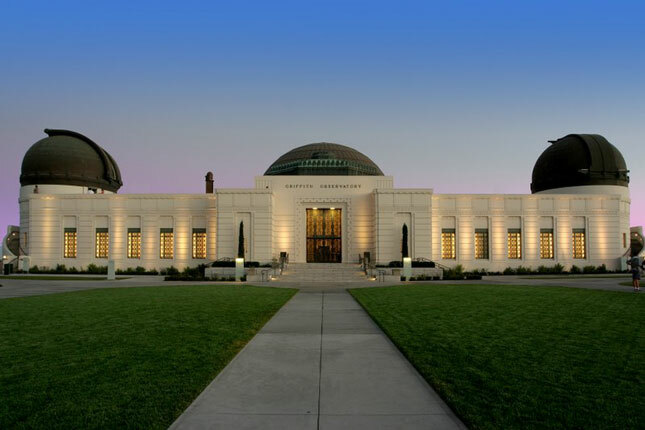 A scene in the second season Angel 1950s episode, "Are You Now or Have You Ever Been," was filmed at the Griffith Observatory. Currently, the Observatory is under construction for renovation and it is not expected to re-open until 2004. [Note from 2010 -- it's open again, and it's spectacular.] But you can still travel to the top for a grand view of Los Angeles and the Valley, and a gorgeous, unobstructed view of the famous Hollywood sign. (2800 East Observatory Road). The exterior of the Ennis-Brown House was the mansion on Crawford Street where Angel, Spike and Drusilla lived in season two of Buffy, and where Angel lived alone in season three. The mansion set interiors on the show were filmed at the studio, but they have some of the flavor of the actual house. 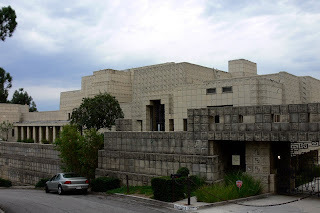 If you want to see the Ennis-Brown House, you may want to check into their offered tours; the house is up in the hills on a narrow, winding road shared by many other houses, the neighbors are sensitive to sight-seers, and there is little to no place to park. 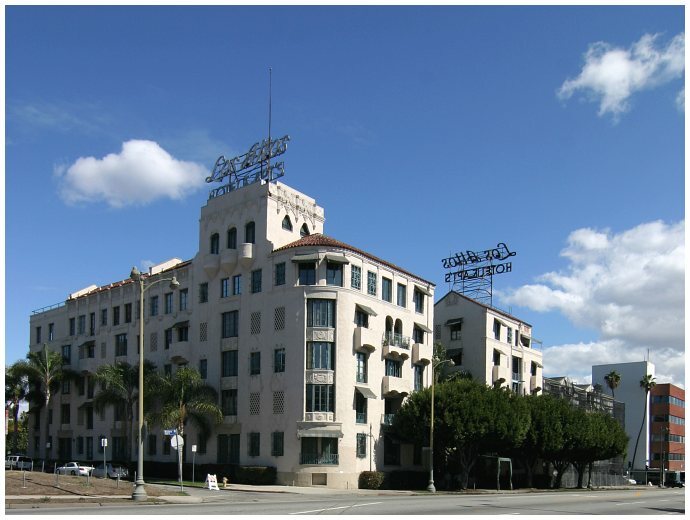 Even though the interior wasn't used on Buffy, it is used occasionally in films (such as Blade Runner, where it was Harrison Ford's apartment). No one currently lives there, although there is a lot of on-site security. In the first episode of season four, "The Freshman," Buffy and Willow enter the impressive library at UC Sunnydale. This is actually the Powell Library on the UCLA campus, and it is absolutely gorgeous. No photos for this one; Billie didn't realize it was a Buffy location until she was actually in the building! 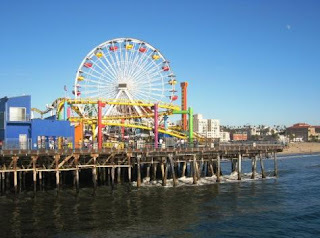 Head west to Santa Monica, and you'll see what is probably the most popular pier in the movies -- the Santa Monica Pier. This is where Gunn and Fred went looking for vamps in the Angel episode "Loyalty." Gunn and Fred took Connor to the beach by the Pier in the episode "Benediction." Gunn and Fred staked the vamps in the carousel building by the Pier. The carousel is antique and quite lovely; it was in the movie, The Sting. 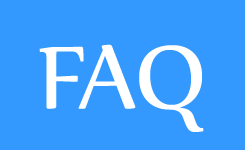 It is often used in filming and for events. 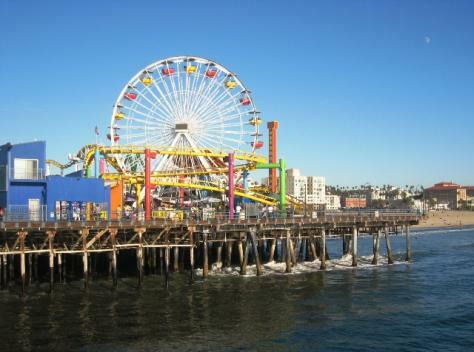 A block or two from the Pier and the carousel in Santa Monica is the Third Street Promenade, an outdoor shopping mall. In the season six Buffy episode,"Entropy," Buffy and Dawn go shopping and find they can't go into any of the shops because of Dawn's previously sticky fingers. And then there's the Holy Grail. The end of the Buffy pilgrimage, so to speak. The warehouses where they shot Buffy. Located in an industrial park area of Santa Monica, the warehouses are huge and anonymous and there are gates and guards and tarps as well -- not a friendly place to park and gawk. But this is Buffy central – the place where all the magic was made for seven seasons. Sadly, by mid-summer, the last vestiges of Sunnydale’s Main Street will be gone. Rumor has it that it may be converted for some Angel shots, or it might just remain dormant until the next Whedon project takes flight. We hope you have enjoyed the tour, ladies and gentlemen. Please stay seated until the Sunnydale High bus comes to a complete stop. And thank you for joining us. Haha I always wondered where the Wolfram & Hart building was. Turns out all I had to do was take Washington instead of Culver on my way home from school. Who knew? Sunbunny, I just hurt myself laughing. Smiles on my face while reading this. I remember a while back when my friend from Rosamond took a massive myriad of pictures of the exterior WB set of the Gilmore Girls. Couldn't be there; interesting substitution. The Griffith Observatory is very beautiful and I also...remember fondly an episode of Star Trek Voyager filmed there. If there is any way you can message me the address of the Summers' house, I would greatly appreciate it. My husband's last birthday in LA is next month (we're moving soon) and we haven't done a Buffy crawl yet, so I'm planning this to surprise him. He is not only a huge fan, but played Xander in the Buffy Sing-a-long for a year. You can even Google him and probably see a picture of him as Xander: "Joshua Ziesel". Anyway, if you could possibly send me that address so that I don't have to drive around Torrance looking for it, I'd be super appreciate. 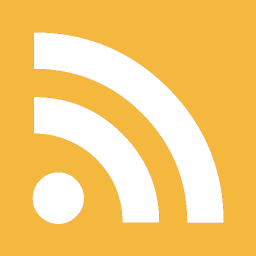 Email is first name dot last name at gmail. Thanks! Hey, Laura -- the actual address is on the internet now. It's very close to the high school. Have fun!